Table of Contents Next: Paris, Archibald C. M.
A tactical maneuver in which troops, either air-dropped or air-landed, attack the rear and flanks of an enemy force, in effect cutting off or encircling the enemy force. The concept of parachute assault was first developed by the Russians, who began experimenting with paratroops in the fall of 1931. By 1935 the Russians had organized parachute battalions, and in 1936 they included a section on paratrooper doctrine in their field manual. The French were next, organizing a parachute training school in 1935, and they were followed by the Germans in 1937 and the Italians in 1938. American officers proposed the use of paratroops to capture airfields for air landing of infantry in 1939, but the Army was desperately short of resources and no immediate action could be taken. German paratroop operations in Holland and Belgium in the spring of 1940 caught the attention of the other powers, and both the Allies and Japan began crash programs to train paratroops. The American Army activated its first experimental paratroop platoon in June 1940, at almost exactly the same time that the British organized their first paratroop school, and the Japanese began their own experiments a few months later. There are newsreels which show early Russian paratroops clinging to the wings of a transport aircraft and jumping off the trailing edge of the wing when it was time to jump. This does not seem like a terribly safe approach to parachuting. 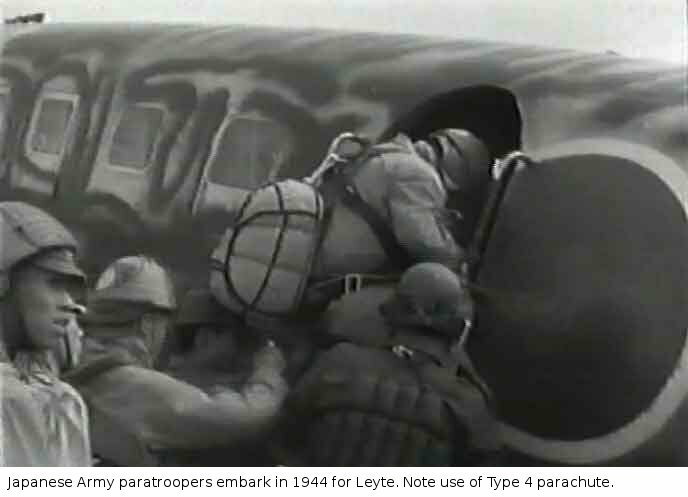 A better method was for paratroops to jump out of the cargo door of a transport and have their parachutes deployed automatically by a static line. 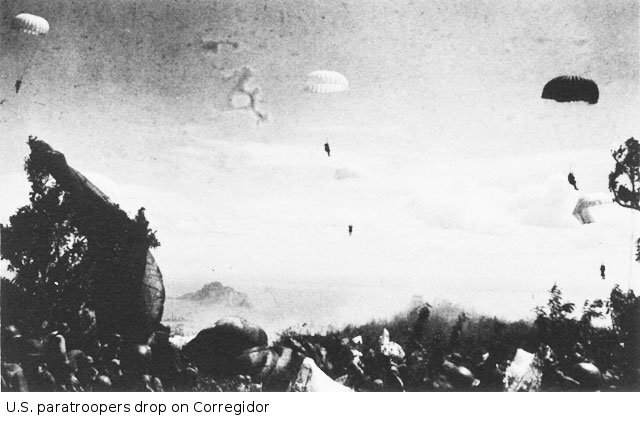 American Army and Marine and Japanese Army paratroops dropped with a reserve chute that could be opened with a rip cord if the main chute failed to open. 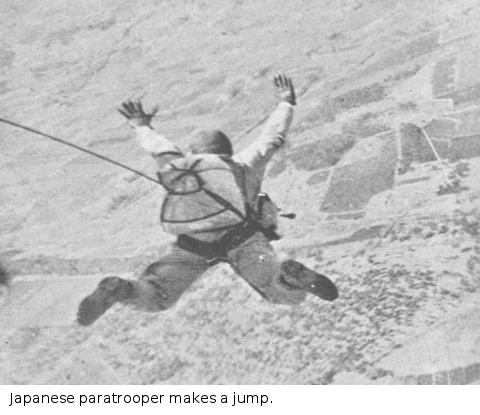 The Japanese Army trained its paratroopers to deploy and then discard their reserve chutes if they were not actually needed, freeing the paratrooper of its weight without the risk to other paratroops of discarded the packed chute. Because paratroops were unable to drop with a full complement of heavy weapons, particularly armor and artillery, they could not match the firepower of regular enemy ground units. Thus, paratroops were often reinforced with glider troops, who could land with heavier weapons, including light artillery and very light tanks. However, gliders were expensive single-use delivery vehicles, and glider delivery was, if anything, even more dangerous than parachuting. Airborne forces lacked a supporting complement of service troops and were dependent on resupply from the air until they were able to join up with conventional ground troops. This reduced their staying power, and airborne forces that were not relieved by friendly regular ground forces within a few days risked annihilation, as with the British airborne forces at Arnhem in the European theater. Air transport of artillery may have been less problematic than supply of adequate ammunition. A 75mm round weighs about 18 lbs (8 kg) so a full Waco glider load of ammunition would be about 200 rounds, which a 75mm battery could expend in just 15 minutes of sustained firing. Paratroops always faced a tradeoff between increased safety and increased equipment load. The heavier the paratrooper and his equipment, the greater the landing speed and the risk of injury for a given parachute design. The Germans and Japanese paratroopers generally jumped carrying only their pistols and a couple of grenades, which allowed drops from low altitude at high speed. All other equipment was dropped in canisters. The Allies quickly learned that a prompt counterattack could catch their Axis opponents at their most vulnerable, when they were trying to locate their weapons canisters and arm themselves. 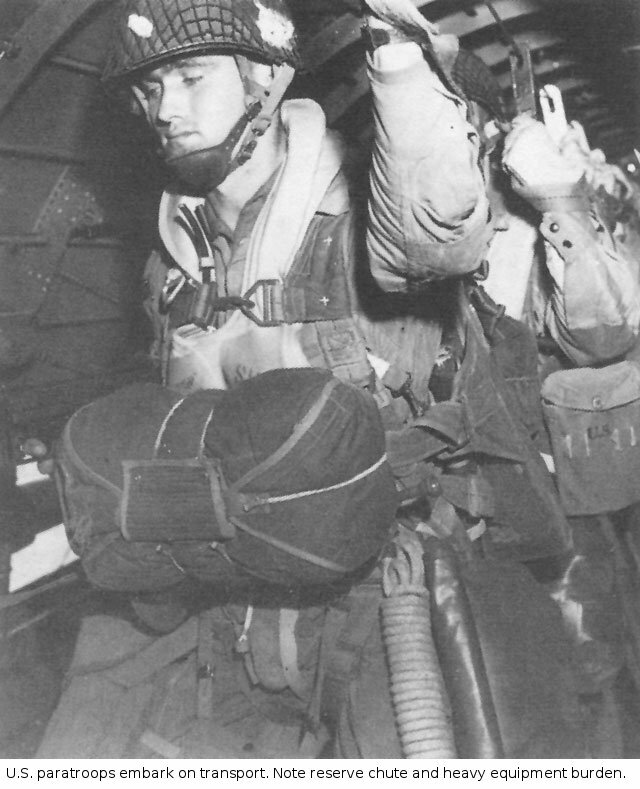 Allied paratroopers jumped with much more gear, including their carbines or submachine guns, which theoretically gave them full firepower from the moment they hit the ground. In practice, they were almost immobile from the weight of their equipment at that point. Furthermore, the Allied paratroopers had to use larger parachutes with lower landing speeds to make their landings safely, increasing the time they were descending helplessly through the air. The Americans introduced a clever compromise, the drop bag, which was lowered by a long cord to hit the ground several seconds before the paratrooper. This meant the paratrooper hit the ground with only part of the weight with which he left his transport aircraft, and his rate of descent decreased significantly in the last few seconds, increasing the safety margin. However, early night drops with the drop bag by paratroops hastily trained in its use were unpromising, as the bags tended to come loose and disappear into the night. Paratroops were not used in the Pacific to the extent that they were used in Europe, but both sides employed them at times. Characteristically, the Japanese Army and Navy developed independent and competing programs. The Navy began experimental trials in November 1940 ("Experiment 1001") and began training volunteers in June 1941 at Tateyama. Two units of 750 men each were authorized, and the goal was to have these activated by November 1941. These two units became 1 and 3 Yokosuka Special Naval Landing Forces. It was quickly discovered that ordinary aircrew parachutes were inadequate for a heavily laden soldier, so the Type 1 parachute was rapidly developed specifically for paratroops. Special carbines and submachine guns that could be folded for the jump were also developed, but they were not available before 1943. The initial Japanese parachute operations were carried out by paratroops who landed German-style, armed only with pistols and grenades until they could locate a weapons canister. The parachute units as a whole were equipped with no weapons heavier than 37mm antitank guns. The 1 Yokosuka SNLF was employed to support the landings at Menado, while 3 Yokosuka SNLF supported the landings at Kupang. By 1943 the tide of conquest had turned and the naval parachute units were returned to Japan and disbanded. The Japanese Army was slightly ahead of the Navy in its training efforts, with the first volunteers beginning jump training in February 1941. However, training was interrupted by a move to Manchuria in May 1941. The 1 Raiding Regiment of 800 men was activated on 1 December 1941 and 2 Raiding Regiment was activated in January 1942. These units were designated Teishin, literally "Dash Forward," and are so identified in West Point histories. They strongly resembled their Navy counterparts, but included engineer units with flamethrowers and demolition charges. 1 Raiding Regiment was to have participated in the attack on Palembang, but their transport caught fire at sea and they lost all their equipment. 2 Raiding Regiment was hastily brought in to take their place, making a major contribution to capturing most of the oil facilities intact. By 1944 the 1 Airborne Raiding Group included glider troops with 75mm guns and a tank unit of Type 94 tankettes. 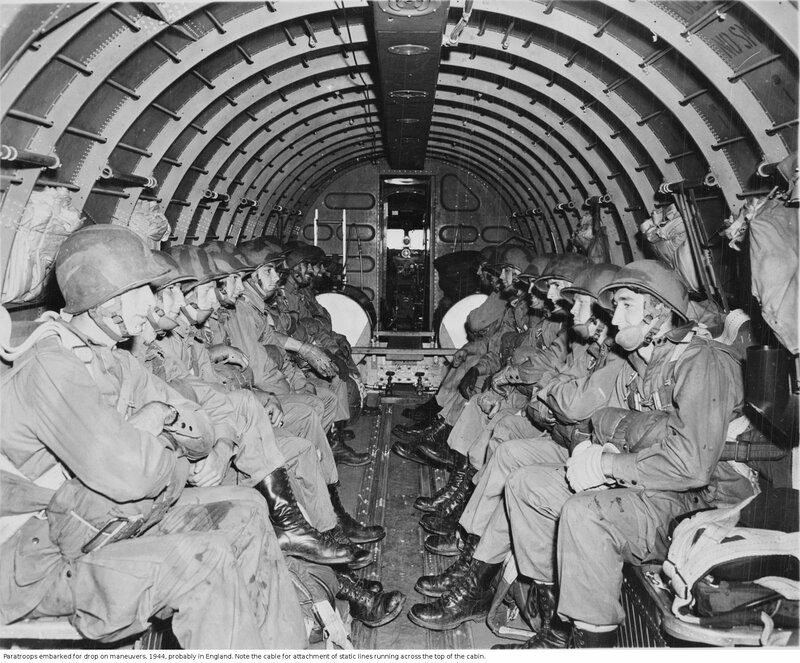 However, the 1 Airborne Raiding Group never participated in conventional operations. Instead, some of the paratroops were used for suicidal attacks on American airfields at Leyte and most of the rest were used as conventional infantry on Luzon. A few more were employed in suicide attacks on American airfields on Okinawa. The Marines had experimented with parachute drops as early as 1927, but formal training of parachutists did not begin until May 1940, doubtless prompted by the German successes in Europe. The Navy was originally responsible for training and equipment, but enough Marine parachutists had been trained by October 1940 to allow the Marines to establish their own jump school at Lakehurst, New Jersey. The first combat platoon was organized in March 1941. Two parachute battalions had been organized by the time war broke out. A Marine paratroop battalion was initially quite small, with an authorized strength of 583 men. Even then, 1 Marine Parachute Battalion was badly understrength when committed to the Guadalcanal operation, with just 397 men. Organization was one headquarters and three rifle companies, and the men went into battle equipped with a folding stock version of highly unsatisfactory Reising submachine gun. This would in time be replaced by the Thompson. Ambitious plans were made for the parachute battalions, none of which came to fruition. Instead, the first three battalions were attached to regular Marine regiments and fought as elite infantrymen in the Guadalcanal campaign, with important actions at Gavutu and Tasimboko. In March 1943 the battalions were gathered into the IMAC Parachute Group, which was soon redesignated 1 Marine Parachute Regiment and deployed to Cape Torokina. Here the parachutists again fought as elite infantry. Prior to the Cape Torokina landings, 2 Marine Parachute Battalion conducted a diversionary raid on Choiseul. Although plans for combat drops were considered several times, the lack of air transport, the distance to objectives, and the fluid tactical situation meant that the Marine paratroopers never made a combat drop. 1 Marine Parachute Regiment was deactivated on 29 January 1944 and its Marines reassigned as cadre for 5 Marine Division. Paratroops require a suitable number of transport aircraft to carry them to their drop zones. The Army Air Forces argued that the paratroops should be placed under Air Force control so that the paratroops and their transport wings could be part of a common command structure. (An early proposal to designate the paratroops as Air Grenadiers got little traction.) The Army Corps of Engineers also got into the jurisdictional dispute, arguing that since paratroops would be employed to seize airfields and bridges, their duties were essentially those of combat engineers. Marshall acknowledged that all three branches had good arguments, but made the decision to keep control of the paratroops with the infantry branch. However, this did not solve the problem of joint command of the paratroops and their transport wings. Air Transport Command (later Troop Transport Command) was organized in April 1942, but it remained part of Army Air Forces, and cooperation between the paratroops and their transport wings was heavily reliant on the rapport between their commanders. The problem was finally (mostly) resolved in late 1943 with the publication of Training Circular 113, which laid out the responsibilities of the paratroops and the Air Transport Command to each other. Training Circular 113 also formalized U.S. Army paratroop doctrine. Air Transport Command relied almost exclusively on the C-47 Skytrain for airborne drops. This aircraft could be equipped with 28 seats for paratroops, but it had only a single cargo door that was small enough to required paratroops to crouch over to exit the plane. The C-46 Commando was favored for its much greater cargo capacity and two cargo doors,but it was in so much demand for transporting supplies that it was never used in the Pacific for air drops. A third aircraft, the C-82, was designed specifically for airborne operations, but only five production aircraft were completed before the Japanese surrender. Additional firepower for the paratroops became available with the activation of the first parachute artillery battery in the summer of 1942. This was equipped with the Pack 75, a 1,282 lb (582 kg) mountain artillery piece capable of being broken down for transport. A battery of four guns with basic ammunition loadout, defense machine guns, and fire control equipment could be dropped by nine C-47s. The equipment was loaded into "coffin bombs" (so named by the gunners for their appearance) that were carried under the belly or wings of the C-47s and dropped with cargo parachutes along with the gunners.It took half an hour to get the guns into action in exercises under ideal conditions; in night combat drops it sometimes took hours to locate all the components and assemble the batteries. The problem was partially solved by connecting all the "coffin bombs" carried by a single C-47 using a heavy rope. The Pack 75s were reinforced after 1943 with short-barrel 105mm howitzers carried by glider. The paratroop drops on Sicily in July 1943 were widely viewed as a fiasco. There were serious losses to friendly fire, the paratroop drops were often many miles from the planned drop zones, and several senior Allied commanders (including Eisenhower) felt the paratroops had not been successful in their mission. (Ironically, the German commanders on Sicily credited the American paratroopers with playing a crucial role in foiling the Axis attempts to drive the landings back into the sea.) This led the top American ground forces commander, Lesley McNair, to question the usefulness of mass paratroop drops or of paratroop formations larger than regimental combat teams. The future of the airborne was investigated by a board led by Joseph Swing, whose report (together with a brilliantly staged airborne exercise, the Knollwood Maneuver) persuaded McNair to retain the airborne divisions. The Swing Board produced a number of other recommendations, many of which found their way into Training Circular 113. 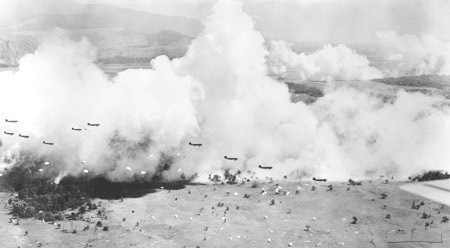 Army paratroops were used in New Guinea as rapid reinforcements, landing against little or no opposition, often on American-controlled airfields. For example, 503 Parachute Regiment landed at Nadzab to secure an abandoned airfield for the drive on Lae. As with the Marine paratroopers, the Army paratroopers were more often deployed as elite infantry, as when the bulk of 11 Airborne Division made a conventional amphibious landing at Nasugbu southwest of Manila during the Luzon campaign. However, paratroops of the 503 Regimental Combat Team dropped into combat on Corregidor, and large numbers of paratroops would have been employed had Japan itself been invaded. Although a number of Indian Army troops received jump training, the only combat parachute drop carried out by British Commonwealth forces in the Far East was a battalion dropped at Elephant Point on 2 May 1945 to seize batteries covering the river approach to Rangoon. As it turned out, Rangoon had been evacuated by the Japanese and the batteries were abandoned, and the DRACULA landings were unhindered. 50 Indian Parachute Brigade fought a crucial action in the defense of Imphal, fighting as elite infantry.